Sadly, we are reminded here that the future of this first class motorsports facility will soon come to an end but, until a ending date is announced, the IEC will continue on until they learn the actual date of their final night. On Saturday, January 23d, the IEC will treat their fans to one of their super fun Night Of Destruction, presented by LKQ. Scheduled on track action will include an enduro race, the Irwindale race truck series, the Pick Your Part compact car demolition derby, Seidner's Collision Center skid plate racing and the always fun trailer racing. On race night the spectator gates will open at 2pm followed a fan meet and greet autograph session at 3:45pm with the first event seeing a green flag at 5pm. Pre sale discount tickets are available through the center's website. General admission tickets, age 13 through adult, are $10 presale and $15 on race day. Kids tickets, are six through 12, are $5. WE'RE STILL WAITING TO HEAR ABOUT THE FATE OF THE IRWINDALE EVENT CENTER. This time last year we knew one thing for certain: the state of the art racing facility was going to, and did, run a full 2015 schedule that included stock cars on the paved oval, NHRA sanctioned drag racing, Formula Drift and special car show events in the facility's pavilion area. The IEC had a very busy and prosperous 2015 season that entertained tens of thousands of fans all year long. The IEC management and staff had every right to be proud of their accomplishments during the 2015 season. Here's what we don't know for certain: how long is it going to last? Late last year we were told how the sale of the 63 acres, that has been the home of the IEC since 1999, had been completed, in September of 2013 for $22 million, and the track would eventually become a retail outlet center, to be built by Irwindale Outlet Partners LLC. that would also feature an entertainment stage, central plaza and dining courtyard. This was followed by published reports, in area newspapers, that said, from construction workers to retail employees, this project could generate approximately 5,000 jobs along with an estimated $2.6 million in annual tax revenue to the local economy. Here's something else we don't know for certain: when is this construction going to start? There was speculation that construction would begin in early 2016. However, late last year Irwindale Outlet Partner LLC made it clear they were not going to begin construction until they had signed lease agreements for a minimum 65 percent occupancy of the available store fronts. Whether or not they have achieved this goal, or how close they are to it, isn't exactly clear at this point in time. In the meantime, the IEC recently released a partial 2016 schedule, from January 7th to July 28th, indicating they are willing to present racing until someone tells them to stop. The vast majority of the schedule features their famed NHRA Thursday Night Thunder Drag Racing program. However there are two special dates also on that new schedule. The first is the aforementioned IEC's fan favorite Night Of Destruction on Saturday and the return of the NASCAR K&N Pro Series West on March 19th. Until the development of this outlet mall begins, it's important the we, the fans, continue to support the special programs at the Irwindale Event Center and thank them for being a major staple in the southern California motorsports landscape during the past 16 years. SACRAMENTO, CALIFORNIA (January 20, 2015) - The Pacific Challenge Series presented by Penney & Associates Injury Lawyers has announced its 2015 awards banquet. The banquet will honor the top-ten finishers in the points standings and will take place Saturday January 30th at Cattlemen's Restaurant in Rocklin, CA. Dinner will be $25 per guest and includes one cocktail. Attendees will have option of steak or chicken with all the fixings. For tickets, call (916) 338-3434. Cocktail hour begins at 6 pm with dinner served at 7 pm with awards to follow. Granite Bay's John Moore will be crowned 2015 champion ahead of 2014 champion Mike Beeler. John's son Cole Moore will earn Rookie of the Year honors for finishing third in the points. The balance in the top-ten of the points was Elk Grove's Ron Chunn, Grass Valley's Don Swartz, Elk Grove's Mike Hite, Folsom's Hunter Corbitt, Eagle, ID's Travis Milburn, Upperlake's Jeremy Doss, and Auburn's Austin Gant. The Pacific Challenge Series was presented in 2015 by: Penney Racing Supply, Penney & Associates, American Racer Tires, Maita Chevrolet, Compact-It, Northwest Compactors, Naake Suspension, Sunoco Fuels, Five Star Bodies, KB Fabrication, Lefthander Chassis, ARP Bodies, Joes Racing Products, Bassett Wheels, Frank's Radio, Racer Bling, and Blakesley Sports Media. All PCS Super Late Models race ABC Bodies or Muscle Car bodies on American Racer Tires with Sunoco Racing Fuel. 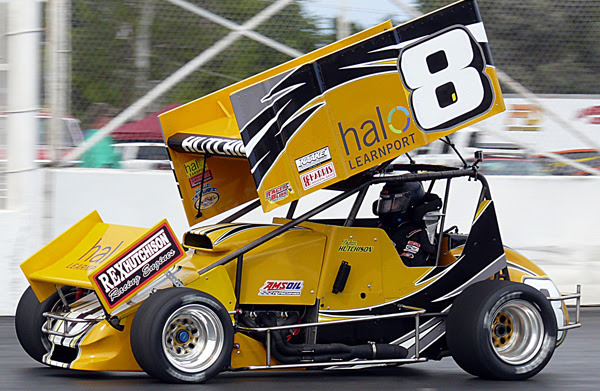 SACRAMENTO, CALIFORNIA (January 20, 2016) – 2015 King of the Wing Western Sprintcar Series Rookie of the Year Dylan Hutchison will return for the 2016 series, campaigning his family-owned #8 Halo Learnport Beast Hutchison in the 14 race series. The former NASCAR K&N Pro Series, West racer made a big splash in his open wheel debut in 2015. The 2016 WSS will hit tracks all over the western United States including five MAVTV & LucasOilRacing.TV televised races at Madera Speedway (CA). The series will also stage its second annual trip to the historic Stockton 99 Speedway (CA) in early August. A return to Havasu 95 Speedway and Tucson Speedway in Arizona is planned for October as well. New on the 2016 slate will be a visit to the ultra-fast 3/8ths mile Rocky Mountain Raceway outside Salt Lake City, UT on Memorial Day. Three rounds of the WSS will be part of the national King of the Wing tour as well, over the weekend of September 30th - October 2nd. September 30th's event is TBA while Saturday October 1st will be staged at Madera and Sunday October 2nd will be at the series' fastest track Kern County Raceway Park in Bakersfield, CA. Hutchison intended to spend 2015 slowly getting up to speed, but found himself with a second place main event finish in just the third race of the year at Madera. Hutchison followed that up with a trip to Stockton where he became one of four drivers to break the all-time track record and he wrapped up the night with a third place feature finish. Hutchison found himself inserted into the championship battle with Davey Hamilton, Jr. and Cody Gerhardt. He continued a string of top-tens finishing eighth at Madera in September and sixth at Havasu 95 Speedway in October. A fourth place finish at Stockton in November set the stage for the three race national King of the Wing weekend to crown the Western champion. Hutchison ran in the top-ten throughout the Friday night main at Madera before a late race spin relegated him to 12th. Perhaps his best run of the entire season came against the national cars at Irwindale. Utilizing a Rex Hutchison Racing Engines iron block 360 against the aluminum 410s on the half-mile, Hutchison recorded a fifth place finish. With a chance to overtake Gerhardt for second in the points, Hutchison had his sights set on Kern County Raceway Park where he unfortunately suffered mechanical problems and had to surrender to the pits early in the feature. Hutchison ended the season third in points with nine starts, four top-fives, seven top-tens, and two heat race victories. Hutchison aims to go for the championship in the Western Sprintcar Series in 2016. His racing program is presented by Halo Learnport, Rex Hutchison Racing Engines, Naake Suspension, All Valley Tow, Rich Howe Racing, RacerBling, and Blakesley Sports Media.